The Axis Group recently aligned with TOA Canada Corporation to provide technology-forward and world-class communications systems for learning environments. The ground-breaking technology enhances educational performance by utilizing infrared (IR) receiver and amplifier mounted into the ceiling environment. • Quick, easy installation requiring just one CAT-5 cable. • Intelligible speech, transmitted by an infrared (IR) wireless microphone system, helps to boost the achievement of kids in a classroom environment. 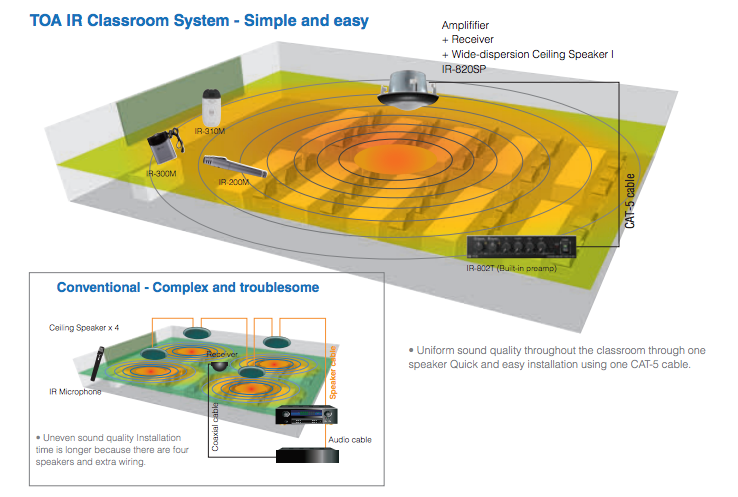 • Infrared (IR) integrated wide-dispersion ceiling speaker distributes uniform sound quality throughout the classroom. • TOA’s light-weight infrared (IR) wireless microphones reduce the physical fatigue of teachers during classes. Call 604 559 AXIS (2947) or Email ROI[at]AxisTech.ca to Schedule a Needs Assessment with our Management Team.